USGBC-Missouri Gateway is excited to partner with the St. Louis Artists’ Guild on the upcoming exhibit, Sustainability and the Built Environment of the St. Louis Region. Sustainability and the Built Environment of the St. Louis Region is an examination of where we stand, as a culture of consumption, and where we may be headed in the future. Focus on sustainability efforts and opportunities of the St. Louis regional built environment. Examples of artwork illustrating the biggest consumers and the best conservationists is currently being sought. The artist’s or designer‘s statement should explain the societal impact of the submission’s subject matter. Artists, designers, architects, creators and design firms are invited to submit work in various media (including photography, three dimensional design, slides, video/film/digital, drawings, etc.) and are encouraged to consider many aspects of the theme. Congratulations to Tony Ruebsam of S.M. Wilson & Co, who was named to the St. Louis Business Journal’s 2011 30 Under 30 list! Tony chairs the USGBC-Missouri Gateway’s Higher Education Subcommittee. We’re so proud that Tony’s listed his work with USGBC-Missouri Gateway as his most rewarding volunteer experience! Please note that you must subscribe to the St. Louis Business Journal in order to access the full article. Cindy Bambini of 3 Degrees, Inc. and Linda Goldstein, Mayor of Clayton, are featured in a June 24 – 30 St. Louis Business Journal article about Clayton becoming the first city in Missouri to earn EPA’s Green Power Community status. Green Power Communities must obtain 3 percent of their energy from alternative sources like wind and solar. Congratulations Clayton! Read more on the Business Journal’s website or on the City of Clayton’s website. The Public Interest Network – a partnership of the Nine Network and the St. Louis Beacon – is seeking your input on buildings that you consider the best example of “adaptive reuse” of once classic buildings in the St Louis area. Since we all know that the greenest building is an existing building, this seems an appropriate task for green building types! What’s your favorite old building with a new, green life? Respond to the Public Interest Network request here. Greenbuild 2011 is coming up soon on October 4 – 7 in Toronto, Canada. The USGBC Greenbuild Scholarship Program provides all-inclusive trips to the Greenbuild International Conference and Expo to individuals entering into the green building industry. In order to increase access to Greenbuild, the scholarship program is reserved for low-income individuals without the means to attend. Greenbuild is the ideal setting for those new to the green building industry to learn from green building experts, discover innovative technologies and companies that are transforming the industry, and to form worthwhile relationships within the green building movement. Learn more about the scholarship or apply here. Energy Star Benchmarking event listing. This program will explore the theory, intent, background and general structure of the International Green Construction Code, the new code developed by the International Code Council (ICC) in partnership with AIA and ASTM. An overview of the codes technical aspects will be discussed and insight will be given to designers as to how they might use the IGCC on their projects. Explain how the IGCC relates to other green building programs and standards. Explore the scope and intent of the IGCC. Identify various unique aspects of the IGCC. Describe the fundamental subject matter covered by each chapter of the IGCC. Discuss how the IGCC will affect the practice of architecture. SPEAKER: Dave Bowman, PE, Manager of Codes for the International Code Council’s Codes and Standards Group. Mr. Bower’s responsibilities include the management of all ICC standards development and the direction and coordination of ICC Staff when assisting or participating in standards development with other organizations. He also maintains the integrity of the referenced standards chapters of the I-Codes and assists code development as the Staff Secretary for the IBC Fire Safety Committee and the IBC General Committee. He provides portions of the IBC Commentary and is involved in the development of the ICC Performance Code. FEE: Free for USGBC-Missouri Gateway Chapter Members, ASHRAE – St. Louis Members, MABOI Members, and Full-time Students; $20 for Non-members. REGISTER: Click here to visit our Event Registration page. Scroll down and click the “Register” button under the International Green Construction Code event listing. A plethora of Chapter founders and leaders are quoted in Construction News and Real Estate‘s July/August edition feature article: 10 Years of Green Building. The article looks at USGBC-MO Gateway’s history, growth, effect, and future in the context of local sustainable development over the past decade. Chapter members Timothy Michels, JoAnn Brookes, Deborah Frank, Marc Lopata, Paul Todd Merrill, and Pat Justis are quoted. “It has been an astounding decade for advocates of sustainable construction in St. Louis. 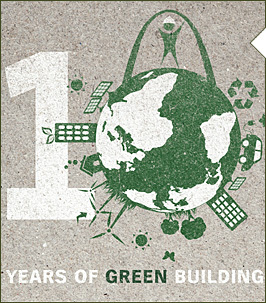 Ten years ago, when Bob Berkebeile helped people in St. Louis start one of the first local chapters of the U.S. Green Building Council, the LEED (Leadership in Energy and Environmental Design) building rating system had been on the market for only a year.